Kick Start Your Season with DCI! 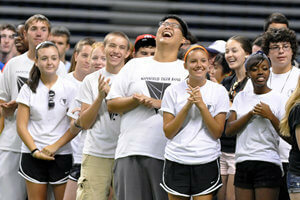 Kick Start your season with Drum Corps International! Drum Corps International and motivational speaker Fran Kick will once again team up to deliver the message of "pursuing excellence in performance and in life." Increase your band's commitment to excellence this summer by inviting all of your students, staff and parents to Kick Start your fall marching band season at any of these select DCI Tour events! This interactive afternoon workshop session plus evening drum corps competition creates a complete experience that's fast-paced and hands-on for students. It's learning-by-doing and not just sitting, listening and watching! Kick Start sessions are FREE with the purchase of a ticket to the corresponding drum corps show, where you'll be able to sit back and see, hear and feel the performances of Marching Music's Major League™ LIVE! Specially put together for Drum Corps International audiences, Kick Start sessions are designed not to just fire a few students up, but to spark a fire in your entire organization! Show students what their commitment to excellence can create when everyone works together. Inspire them to reach new levels of responsibility, discipline and self awareness, all while nurturing the core values that will help them succeed in life. PLUS you will have the opportunity to see some the finest Drum Corps International performing ensembles up close, pursuing personal and performance excellence both on and off the field. Kick Start sessions at all of the following events begin two hours before the first drum corps steps off except at the DCI World Championship Finals. Today, Fran presents more than 100 programs every year across the country to thousands of college/university, high school and junior high/middle school students, plus the many people who work with them. In addition, he works with association/convention and corporate organizations who are actively engaged in teaching and reaching kids. Fran speaks at many state, regional and national conferences, and he has consulted with numerous schools, organizations and companies. From fifth-grade students to Fortune 500 professionals Fran Kick always KICKs IT IN! Every year from 1992-1997 Fran presented more than a dozen Regional Leadership Workshop programs with Attitude Concepts for Today, Inc., a nationally recognized seminar/workshop company specializing in youth. In addition to his busy travel schedule, Fran taught as a consulting adjunct faculty member at Wilmington College (Ohio) and served as the consulting director for the Wilmington Leadership Institute from 1995-1998. During this time, Wilmington College was recognized by the National Clearinghouse for Leadership Programs and the Higher Education Research Institute as one of the top 16 programs in the U.S. The program was also selected for inclusion in the 7th Edition of the Center for Creative Leadership Education Source Book. Having spent three years as a psychology assistant in a clinical practice as well as a consulting associate for a child and youth development center, Fran has experience counseling students weekly on a one-to-one basis. He has also appeared on television a number of times including WDTN-TV News, an NBC affiliate, and WRGT-TV, an affiliate of the FOX Television Network, where he was the host and coproducer for the TV show TEENTALK. Fran's writing has appeared in numerous state and national educational publications. The U.S. Department of Education's Office of Educational Research and Improvement's ERIC Clearinghouse published Fran's work entitled The Self-Perceptions of Self-Concept and Self-Esteem and selected it for inclusion for the Resources in Education Index. He authored the student leadership series KICK IT IN and TAKE THE LEAD! and coauthored Portfolios Across the Curriculum and Beyond published by Corwin Press, Inc. His most recent releases include the first two books of a series entitled What Makes Kids KICK. He has his B.A. in Education and a M.A. in Educational Psychology. 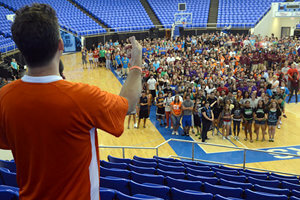 Questions about bringing your group to a Kick Start event? Contact Drum Corps International Relationship Manager Scott Dixon by e-mail at groups@dci.org or by phone at 317.275.1234.